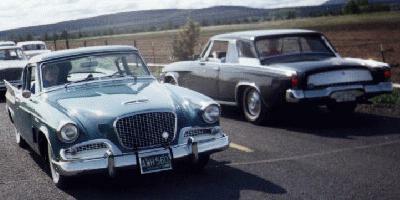 This sharp 1961 Studebaker Hawk Coupe belongs to Bruce Lantz of Yelm, Washington. 1961 was the last year for the finned Hawk. 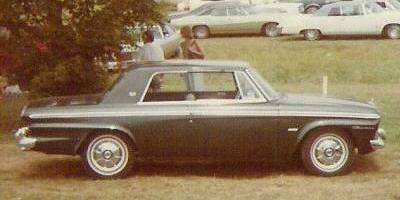 This was the only year that the finned Hawk was available with bucket seats and a four speed manual transmission. The 1961 model is easily spotted by the contrasting color stripe below the rear tail fin. Otherwise, it appears much the same as earlier finned Hawks. The GT Hawk heading in the opposite direction is a 1963 model. Here is another shot of Bruce's Hawk parked next to a Conestoga wagon. This shot clearly shows the contrasting color stripe below the rear tail fin on 1961 Hawks. The picture was taken back in the 1970's at the height of the CB radio craze. If you look close, you can see a CB antenna clipped to the passenger side rain gutter on this car. The mag wheels are not stock but they sure look great. The 1961 Hawk was marketed as a limited production car and a realtively high percentage of 3,929 that were produced seem to have survived. This nice late model Champ Pickup has the 6 foot short wide box and is sporting 1964 Studebaker car style hubcaps. When it was introduced in 1960, the Champ had to get by with the old style narrow box with external fenders from the C Cab trucks. The wide box became available in 1961 and was much more modern looking. Studebaker bought the wide box tooling from Chrysler and modified it for the Champ. The wide box came in both six foot and 8 foot versions. 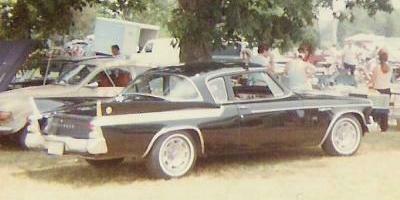 This picture shows a rare 1964 Studebaker Daytona Hardtop. Only 2,414 Daytona Hardtops were produced for 1964. This car is painted Jet Green which is the same color as my 1964 Commander Special. Daytonas could be ordered with Avanti R1 and R2 engines and a small number were produced that way. 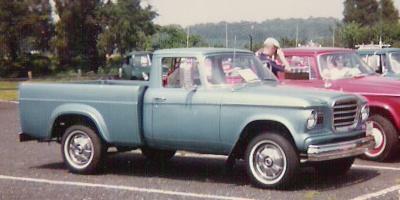 A four speed manual transmission was available with the regular Studebaker 259 and 289 cubic inch V8 engines. 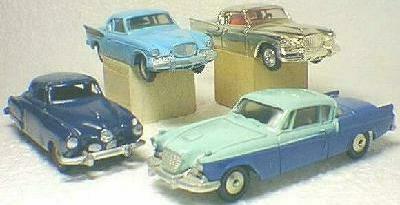 This great shot of four Studebaker Toys arrived in my e-mail. The two 1957 Golden Hawks are diecast Corgi Toys from England. The 1956 Golden Hawk and the bullet nose Stude are American made dealer promos. All are relatively hard to find today, particularly in the condition shown.